a. ^ Article 4 of the Constitution of Ireland declares that the name of the state is Ireland; Section 2 of the Republic of Ireland Act 1948 declares that the description of the state is the Republic of Ireland. 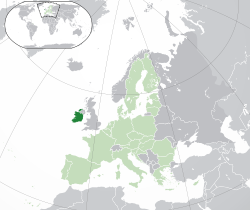 Ireland is a European country on the island of Ireland. It is a member of the European Union. The country is sometimes called the Republic of Ireland in order to distinguish between the territory of the Irish state and island proper, but Ireland is its official name. It covers about five-sixths of the island of Ireland. The other sixth is called Northern Ireland, which is still part of the United Kingdom. The republic's capital is Dublin. Cork is the second largest city in the country and the third largest on the island of Ireland. The population of Ireland is 4.6 million. English is the main language spoken. The Irish language is widely taught in all schools, and it is still spoken as a first language in some areas of the country, known as the Gaeltacht. Irish is the first official language, followed by English. Several hundred years ago, the English took over the country and made it part of the United Kingdom in 1801. Ireland left the United Kingdom in 1922 and has been an independent country since then. The head of State, the President, is elected for seven years by the adult citizens. The same president can only be elected twice (14 years). Most of the president's tasks are representing and ceremonial ones. The president has little power over the government. Ireland is a democracy and people vote for their representatives. The Taoiseach (equivalent to a prime minister) is selected by the parliament. The Taoiseach is usually the head of the biggest party. The Oireachtas (equivalent to the parliament) consists of the Dáil Éireann (the lower House) and the Seanad (the 'upper House'). The system is similar to that of France or the United States, except that the President is not an executive. The main political parties in Ireland are Fine Gael 25%, Sinn Féin 22%, Fianna Fail 18%, the Labour Party 7% and others, ref RED C poll 29 th June 2014. ↑ 1.0 1.1 1.2 1.3 "Ireland". International Monetary Fund. Retrieved 29 April 2011. ↑ John Coakley (20 August 2009). Politics in the Republic of Ireland. Taylor & Francis. p. 76. ISBN 9780415476720. Retrieved 2 May 2011. This page was last changed on 1 March 2019, at 01:53.